What’s that you say? 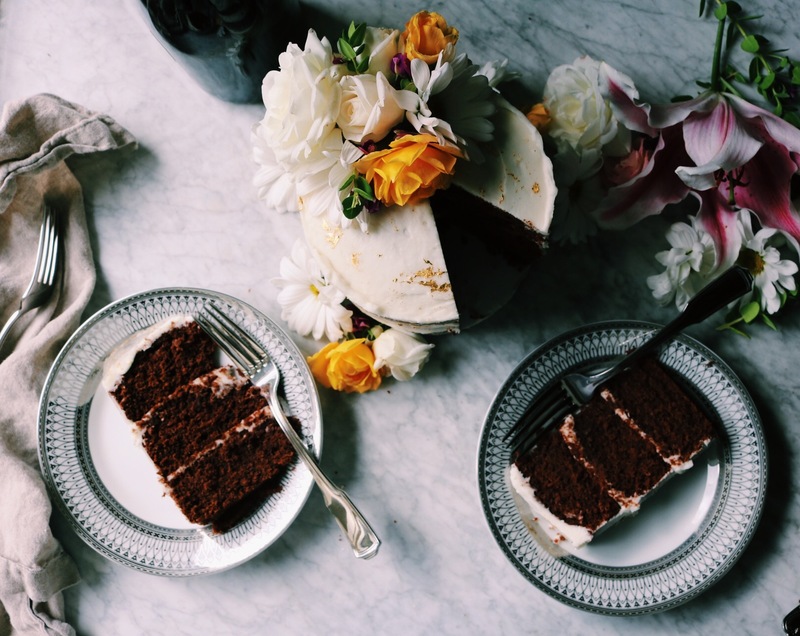 You need one more holiday dessert to choose from? Ok. Yep. I got ya covered. This takes a nod from one of my first posts on DisplacedHousewife. 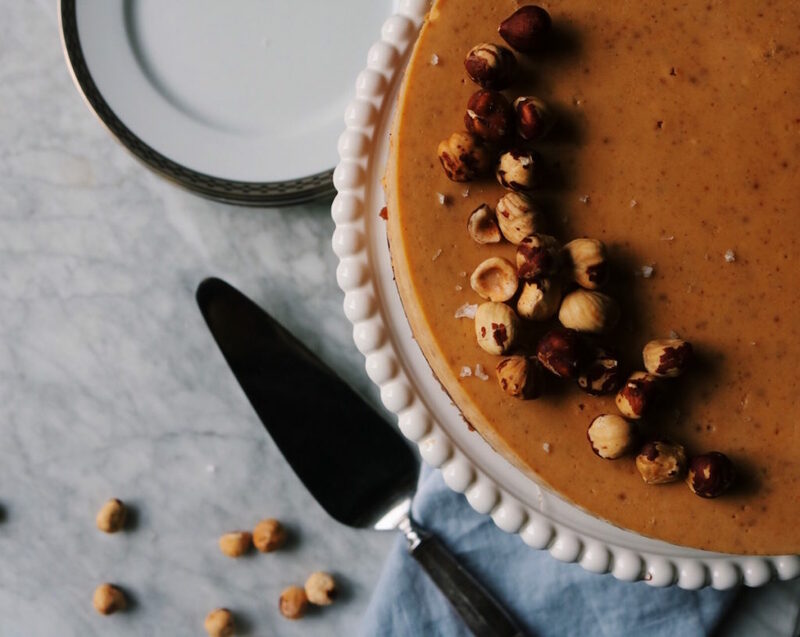 It was a Salted Caramel Pumpkin Cheesecake and it went CRAZY on Instagram. It might have been my first recipe to do so. I wanted to reinvent her this year. So we use hazelnuts in the crust and because we were feeling extra decadent. 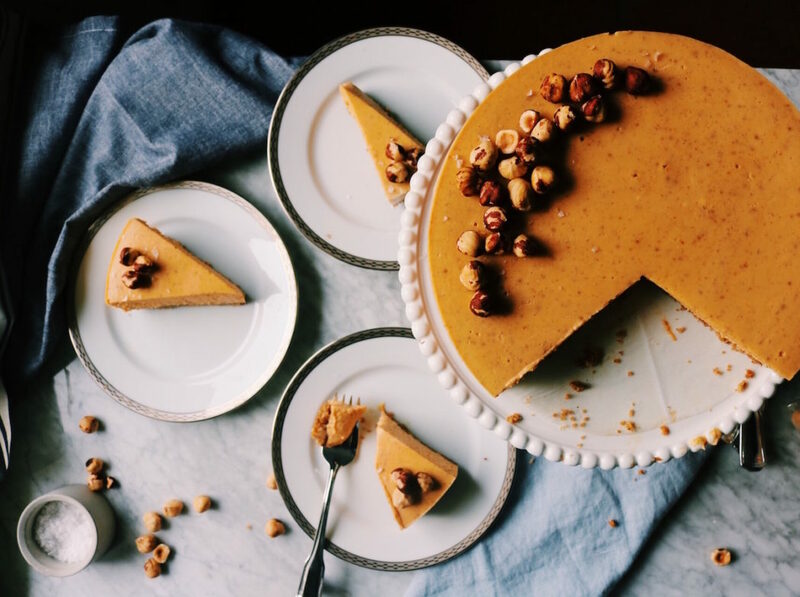 We sandwiched a nice layer of chocolate hazelnut spread between the crust and the pumpkin and voila: pumpkin hazelnut cheesecake! This is my second post in collaboration with Diamond of California. We have a year-long partnership that I’m super excited about and until we started working together I didn’t realize how often I reach for nuts for texture and flavor when baking. 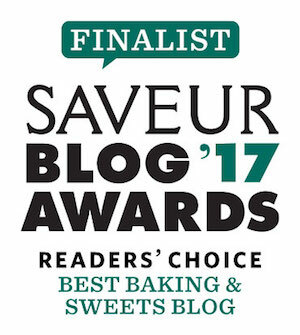 I have one more holiday sweet recipe coming up in December with them and then after the start of the year I will do some savory posts. Perhaps something healthy to start the year off right? An appetizer for Super Bowl? Let me know your thoughts/requests via email, DM or leave a note below! This is my first year in as long as I can remember that I’m not actually hosting Thanksgiving dinner…I’m equally crushed and relieved. Sometimes we just feel too busy, am I right? So to that end, I’m SUPER excited to sit on my mom’s couch, sip wine, eat too many appetizers and stuff myself on mash potatoes, gravy, stuffing and dessert. Because those are my basic Thanksgiving food groups. What are you guys looking forward to eating? Drinking? Doing? Hazelnuts. I didn’t bother skinning them. 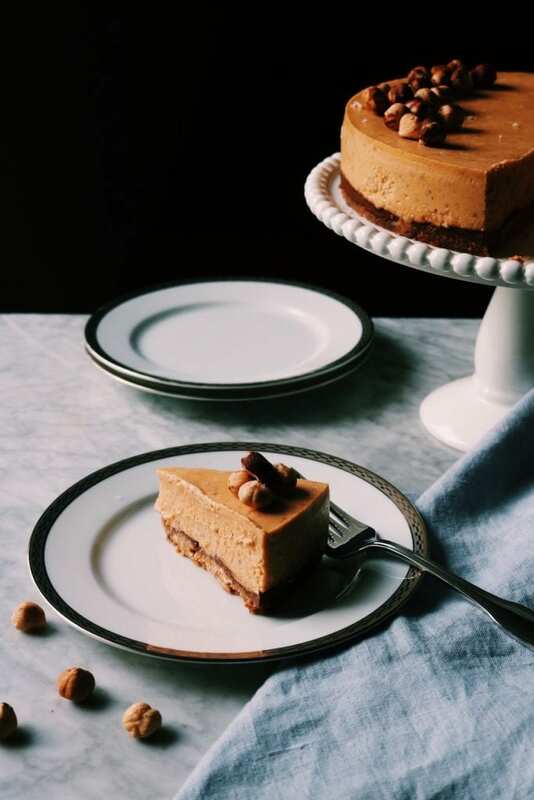 It was completely unnecessary in the crust and I think they look pretty on top of this pumpkin hazelnut cheesecake with the darker + lighter colors showing. I used raw and unsalted hazelnuts. Chocolate Hazelnut Spread. You can buy it at the store or make your own. Try this recipe! Timing. Cheesecake isn’t intensive to make, but you need to allow time at certain steps. We need to drain the pumpkin on paper towels to get rid of some of the excess moisture; let the crust cool a bit before smearing on the hazelnut spread; let the finished cheesecake cool in the turned-off oven; let it cool some more on the countertop; and finally, I recommend at least several hours or ideally overnight to chill in the fridge. The work of making the cheesecake is minimal but do allow extra time for these steps. Mixing. Always mix your cheesecake filling on low to minimize the potential for cracks. To that end, have all of your ingredients at room temperature to facilitate easy mixing. Water Bath. Don’t skip it. It may sound like a pain but it’s really not. It helps keep the cheesecake nice and moist and, again, crack free. Necessities. You’ll need a large roasting pan or casserole dish to place your cheesecake in while baking, so have that handy. Additionally, you’ll need a 9-inch springform for the cheesecake. I have made cheesecakes in regular cake pans which will work fine, it will just be A LOT harder to get it out and make nice, gorgeous slices. Clean Slices. Use a very sharp knife and clean it in between cuts for razor-sharp slices. 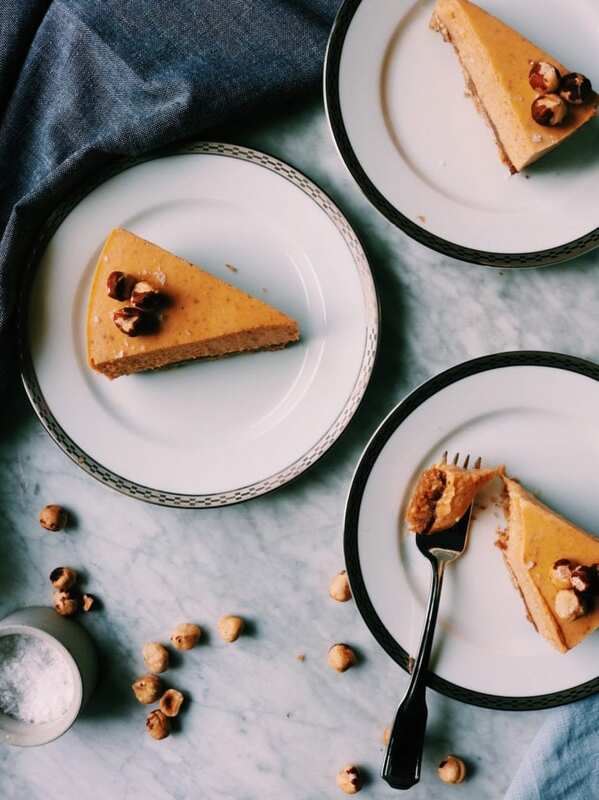 Let’s make some holiday magic in the form of pumpkin hazelnut cheesecake, shall we? Spread the pumpkin puree on a couple of layers of paper towels to get rid of any excess moisture. Let drain for several hours. Preheat your oven to 350 degrees F. Butter a 9-inch nonstick springform pan. Put a kettle on to heat up some water. You’ll need this for your water bath. Put the graham crackers, hazelnuts and brown sugar in a food processor fitted with the blade and pulse until the mixture becomes a fine crumb. Drizzle melted butter on top and pulse until just mixed and resembles wet sand. Press the mixture into the bottom of the prepared springform. Place the crust in the center of the oven for 10 minutes or until it starts to turn a little golden. Set aside to cool. Once cooled, spread the chocolate hazelnut spread over the crust, wrap the bottom of the springform pan in two layers of foil and set in the center of a roasting pan. Increase your oven temperature to 400 F.
Put the cream cheese and granulated sugar in an electric-stand mixer fitted with the paddle attachment and beat on low until smooth. 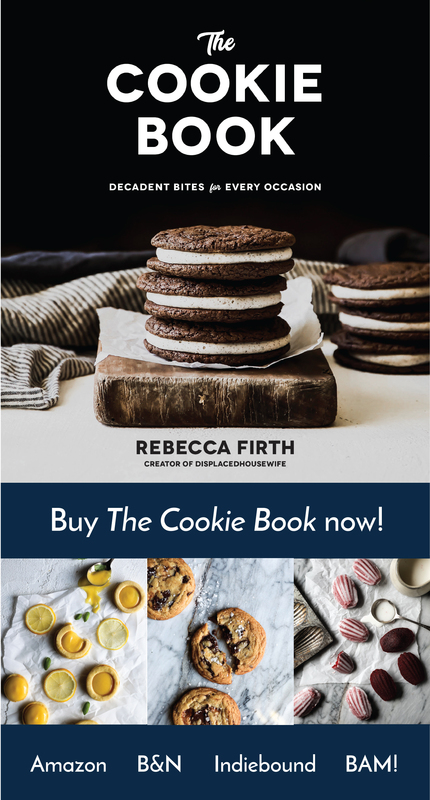 A couple of notes here… First, if you don’t have an electric-stand mixer you can use your beautiful arms and a spatula to beat it into submission. Second, you don’t want to add too much air, at any point, into this creamy mixture. Too much air can make unsightly cracks on your cheesecake. Thus keep it to a low-speed beating as much as possible. Once the cream cheese is smooth, add the salt, cinnamon, cardamom, cloves, ginger and nutmeg. Scrape the pumpkin off of the paper towels and in with the cream cheese mixture. Mix until completely combined taking care to scrape the sides and bottom of the mixing bowl so that everything is incorporated (do this periodically). Add the eggs, one at a time, making sure they are completely blended before adding the next. Lastly, add in the cream and vanilla. If you have any rogue bits that are still in chunks, smash them against the bowl to smooth out or you can pass the mixture through a sieve to eradicate any chunks. Pour the mixture on top of the hazelnut spread and place the roasting pan in the center of the oven. Pour your boiling water in the roasting pan being careful not to get any water in the springform pan with your cheesecake. Fill to about 1 cm up the side of the cheesecake pan. Should be about 3 to 4 cups of water. Bake for 15 minutes and then turn the temperature to 250 F and bake for 1 hour more. 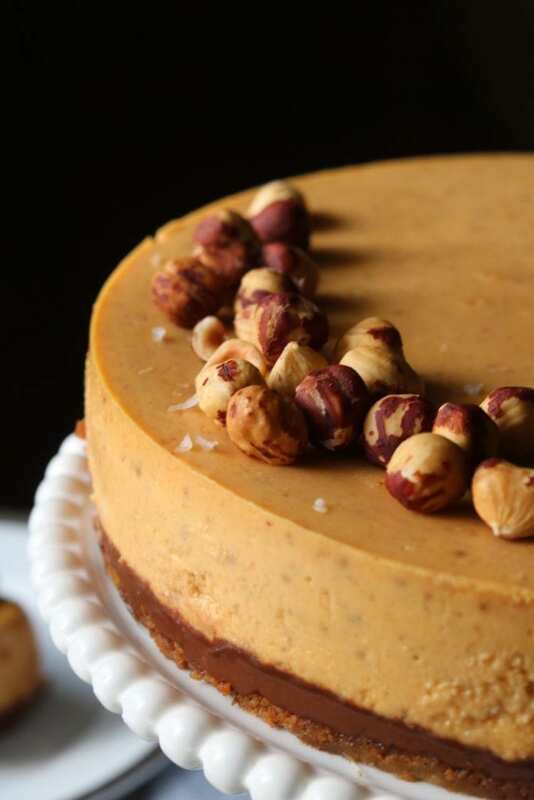 When the timer goes off, turn the oven off and let the pumpkin hazelnut cheesecake sit in the oven for 30 minutes, with the door open. Transfer to the counter to cool for several hours more. Once cool to the touch, wrap tightly and place in the fridge until ready to serve. 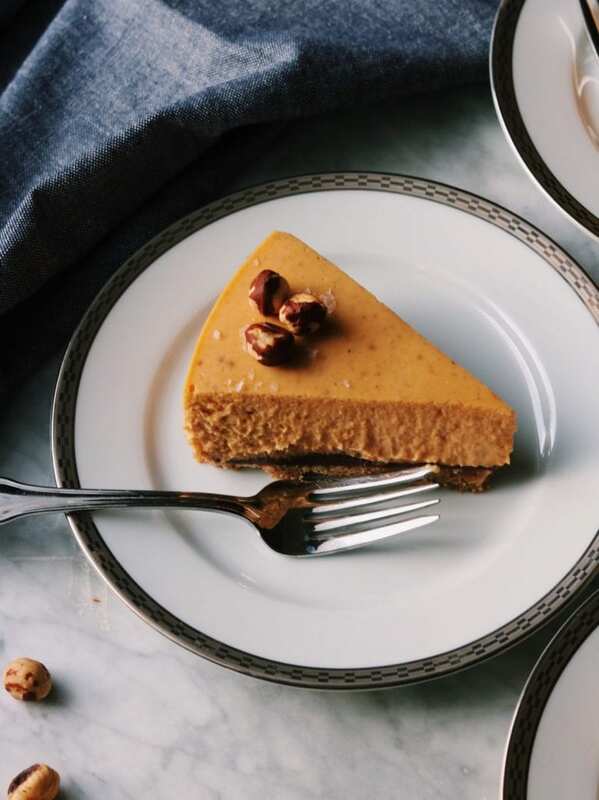 A reinvention of pumpkin cheesecake. Hazelnuts in the crust + chocolate hazelnut spread between the crust and pumpkin for tasty pumpkin hazelnut cheesecake. When ready to serve, take the side of the springform pan off…you may need a knife to gently run along the side. Periodically clean the knife with a damp cloth to keep everything as clean and smooth as possible. Follow this advice when cutting slices. Garnish the top with raw hazelnuts + sea salt flakes. Oh this cake looks simply awesome! OMG !!! Stunner as always! I am loving both your cheesecake recipes! I love that you used hazelnuts in your crust – such a beautiful rich texture it would provide I am sure! and your pictures are gorggggg!!! I love that last shot especially. Wow Rebecca!!! This looks gorgeous and love all the moody pictures. I am a big huge fan of pumkin desserts and this one is no exception. Love the use of all the spices here.